The chemical analysis can be either quantitative or qualitative in nature. Qualitative analysis mainly deals by the identification of substances present in a given sample. For inorganic compounds, qualitative analysis often comprises the recognition of ions present in a sample. The methods you will learn can be employed to recognize ions occurring in other kinds of samples like minerals, ground water and industrial waste streams. These principles comprise those comprised in acid-base chemistry, oxidation-reduction reactions, ionic equilibria, precipitation reactions and the complex ion formation. 1) Separation: These are the methods which separate the groups of ions from other groups, or individual ions in the mixture of ions. Concentrating on our goal to correctly recognize the metal cations that are present in our unknowns, the simplest plan we can assume would comprise one that consists of a particular reagent to test for each and every different cation. In such a plan, each and every reagent would be needed to provide a simply recognized confirmation test, like color change or precipitate formation, for just one of the cations in the mixture, in spite of of the other cations present. Though, various metal cations can at times show identical behavior and a particular reagent for each and every separate cation is not possible. In another words, individual components in our unknowns would most probable interfere with one other. Thus, in the plan that we will use, reagents will be employed to separate the ions in our samples to groups. Each and every group will then be examined for the presence or absence of individual metal cations. The most general way to subdivide into smaller groups is via selective precipitation, in which a small group of cations is chemically precipitated. The ions in precipitate can then be physically separated from such remaining in solution via centrifuging. The precipitate (or solid) settles out and the solution (or supernatant) is transferred to the other container. In this manner, the initial large group is separated to smaller and smaller groups till definitive tests can be run to verify the presence or absence of each and every specific cation. It is significant to recognize the difference between each and every group in qualitative analysis and the groups of the Periodic Table (that is, alkali metals, transition metals and so on); the cations in each and every group don't necessarily correlate by groups in the Periodic Table. The groups of Periodic table are mainly based on similarities in electron configurations which result in similar behaviors of the elements in the group. Some of the cations in our groupings do fall in the similar Group in the Periodic Table, and others don't. The Groups we utilize in qualitative analysis are based solely on the solubility behavior of the cations beneath specific conditions. For illustration, Group 1 comprises of cations which form insoluble chlorides in the acidic solution. In each of these Groups, the analysis might need that there are further separations into subgroups. The specific or confirmatory test will be taken out for each ion whenever separations have ensured that interfering ions have been eliminated. At times this will mean isolation of a given ion from all other cations. In other cases, this will be possible to carry out confirmatory tests in the presence of one or more other cations of the similar group. To be successful, care should be taken to follow the methods carefully; components which are not separated correctly might interfere by later tests. 2) Confirmatory Tests: These are the tests which find out conclusively that some ion is present. Interfering ions are eliminated prior to a confirmatory test is done. According to the properties, cations are generally categorized into five or six groups. Each and every group consists of a common reagent that can be employed to separate them from the solution. To acquire meaningful results, the separation should be done in particular sequence, as some ions of an earlier group might as well react by the reagent of a later group, causing ambiguity as to which the ions are present. This occurs because cationic analysis is mainly based on the solubility products of the ions. As the cation gains its optimum concentration required for precipitation it precipitates and therefore allowing us to detect it. In common, concentrations of reagents and pH are adjusted in such a way that just one group is influenced by the precipitating reagent. Once a chosen group is precipitated out of solution, it is eliminated by first centrifuging the mixture to obtain all the precipitate out and then collecting the supernatant (that is, potentially having other groups) by a procedure termed as decanting. In a mixed solution, the supernatant can be further tested for other groups via selective precipitation and the remaining precipitate can be tested for Group members by further selective precipitation and confirmatory test. The division and accurate details of separating into groups differ slightly from one source to the other; given below is one of the generally used plans or schemes. This comprises of ions which form insoluble chlorides. As such, the reagent employed to separate this group is hydrochloric acid, generally employed at a concentration of 1 to 6 M. Concentrated HCl should not be employed, as it makes a soluble complex ion ([PbCl4]2-) with Pb2+. As a result the Pb2+ ion would go undetected. The most significant cations in 1st group are Ag+, H22+ and Pb2+. The chlorides of such elements can't be differentiated from one other via their colour - they are all white solid compounds. PbCl2 is soluble in hot water, and can thus be simply differentiated. Ammonia is employed as a reagent to differentiate between the other two. As AgCl dissolves in ammonia (because of the formation of the complex ion [Ag(NH3)2]+), Hg2Cl2 provides a black precipitate comprising of a mixture of chloro-mercuric amide and elemental mercury. Moreover, AgCl is reduced to silver under light that provides samples a violet colour. If the required concentration of HCl is added to the solution having metal ions. The presence of a white precipitate points out the presence of one or more Group I cations. If no precipitate forms, there were no Group I cations present in the solution and you can carry on by testing for Group II cations. PbCl2 is far more soluble than the chlorides of the other two ions, particularly in hot water. Thus, HCl in concentrations that fully precipitate Hg22+ and Ag+ might not be adequate to do similar to Pb2+. Higher concentrations of Cl- can't be employed for the before illustrated reasons. Therefore, a filtrate obtained after first group analysis of Pb2+ includes an appreciable concentration of this cation, adequate to give the test of the second group, that is, formation of an insoluble sulphide. For this reason, Pb2+ is generally as well comprised in the 2nd analytical group. The method for finding out group I cations comprises adding the sample in water and then adding dilute hydrochloric acid. A white precipitate is made. The precipitate is separated out of solution via centrifuging the solution in a balanced centrifuge and the supernatant is decanted to a separate test-tube. Around 5 ml of distilled water is added to the precipitate and heated in a water-bath for around 5 minutes by stirring. The remaining precipitate is centrifuged. The supernatant is decanted to a dissimilar test-tube leaving behind the precipitate. The precipitate is saved for further testing of Ag+ and Hg22+. Lead (II), Pb2+, is the only cation of Group I which is soluble in hot water. Thus the supernatant should be tested for the presence of pb+. To the supernatant 2 to 3 drops of 6M acetic acid (CH3COOH) and 3 to 4 drops of 1M K2CrO4 is added. The formation of yellow precipitate of lead chromate, PbCrO4, verifies the existence of lead. It might be essential to centrifuge the solution in order to view the precipitate as it might be masked via the orange color of the K2CrO4 reagent. It is now essential to consider the precipitate which might be comprised of AgCl or Hg2Cl2 or a mixture of the two. By adding NH4OH to the solution, the AgCl and Hg2Cl2 can be separated. By the addition of ammonium, if the precipitate is insoluble, then Pb2+ is present; if the precipitate is soluble, then Ag+ is present, and if the white precipitate turns black, then Hg22+ is present. This comprises of ions that form acid-insoluble sulphides. Cations in the 2nd group comprise: Cd2+, Bi3+, Cu2+, As3+, As5+, Sb3+, Sb5+, Sn2+, Sn4+ and Hg2+. The Group II cations are chloride soluble ions and as a result they are readily separated from the slightly soluble Group I chloride insoluble cations. They can be further separated to groups via selective precipitation of a number of sulphides. HgS, Bi2S3, CuS, SnS and SnS2 precipitate from reaction by H2S in 0.3M H+. Due to any of the Group I cations (Ag+ and Hg22+) have already been eliminated by the Group I precipitation, we don't have to worry about precipitation of Ag2S or Hg2S, even although they will react with H2S. Note: Even although Pb2+ ions are precipitated and filtered off as PbCl2 in the Group 1 analysis, there might be adequate residual Pb2+ in solution to precipitate as PbS. As a result, most of the analytical schemes will place Pb2+ in both groups I and II. The precipitation method will yield in a mixture of a number of sulphides. It is essential to separate and recognize the components of the sulphide mixture. If Sn is present, or assumed to be present, it is first essential to treat the solution by a little H2O2 in order to oxidize Sn2+ to Sn4+ before the Group II sulphides are precipitated via H2S. Once the Group II cations are precipitated, SnS can be eliminated from the bulk via dissolving it in ammonium sulphide (NH4)2S as it is the only Group II sulphide which is soluble in the ammonium sulphide. HgS, Bi2S3, PbS, CdS and CuS can be separated via differential solubility. HgS is insoluble in the nitric acid whereas the rest of the group II cations are soluble. Thus, whenever the sulphide precipitate is treated by HNO3, HgS and S must remain as a precipitate whereas the rest of the cations must remain in solution. However HgS doesn't dissolve in HNO3, it will dissolve in aqua regia (HCl and HNO3 mixed) and the resulting HgCl2 can be employed to confirm its presence. SnCl2 (that is, stannous chloride) is then added to the resulting HgCl2. Sn2+ is oxidized to Sn4+ and disproportionation takes place whenever HgCl2 is reduced to Hg2Cl2 (s) (white) and Hg (s) (black). Pb2+ can be eliminated from the cation mixture by precipitation by (NH4)2SO4 as PbSO4. The PbSO4 can then be dissolved in the ammonium acetate (NH4C2H3O2) and the lead precipitated out as yellow PbCrO4 on reaction with K2CrO4. Bi3+can be eliminated from Cu2+and Cd2+ via the addition of NH4OH to the solution. Bi3+ makes a white precipitate (Bi(OH)3) whereas Cu2+ and Cd2+ remain in the solution. Reaction of Bi(OH)3 by sodium stannite gives mount to black elemental bismuth. The Cu(NH3)42+ formed, if copper is present, provides the solution a blue color. Separation of Cu2+ from Cd2+ is completed by the reduction of Cu2+ to elemental copper by employing sodium dithionite as a reducing agent. Reaction of the isolated cadmium by thioacetamide gives mount to the yellow sulphide precipitate of CdS. This group comprises ions that make hydroxides which are insoluble even at low concentrations. The reagents are identical to those of the 2nd group; however separation is conducted at pH of 8 to 9. Occasionally, a buffer solution is employed to make sure this pH. Cations in the third group are, among others: Fe2+, Fe3+, Al3+, and Cr3+. The group is found out by making a solution of the salt in water and adding ammonium chloride and ammonium hydroxide. The Ammonium chloride is added to make sure low concentration of the hydroxide ions. The formation of a reddish brown precipitate point out Fe3+; a gelatinous white precipitate point out Al3+; and a green precipitate point out Cr3+ or Fe2+. These last two are differentiated by adding sodium hydroxide in surplus to the green precipitate. If the precipitate dissolves, Fe2+ is indicated; or else, Cr3+ is present. The fourth group of cations comprises Zn2+, Ni2+, Co2+, and Mn2+. Of such, Zinc salts are colourless, Manganese salts are faint pink or colourless, and Nickel and cobalt salts might be brightly colored, mainly blue-green. The precipitate, washed in water is reacted by extremely dilute hydrochloric acid. This precipitates nickel salts, if any. The supernatant liquid is filtered and reacted by surplus of Sodium Hydroxide. This precipitates any Manganese salts. Hydrogen sulphide is passed via the supernatant liquid. Whenever a white precipitate forms, then Zinc is present. Some of the sources of Group III and Group IV cations come in Group III cations. 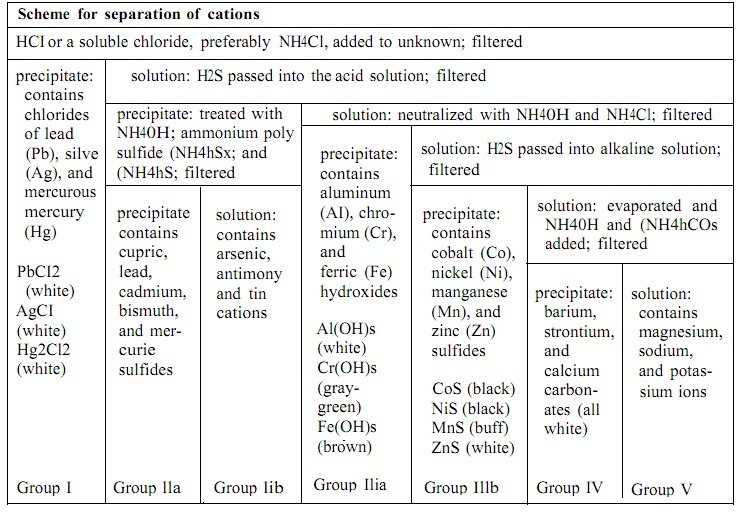 Ions in fifth analytical group of cations form carbonates which are insoluble in water. The reagent generally required is (NH4)2CO3 (at around 0.2 M), having a neutral or slightly basic pH. All the cations in the prior groups are separated beforehand, as most of them as well form insoluble carbonates. The most significant ions in the fifth group are Ba2+, Ca2+, and Sr2+. After separation, the simplest way to differentiate between such ions is via testing flame colour: barium provides a yellow-green flame; calcium provides orange-red, and strontium, deep red. Cations that are left after carefully separating prior groups are assumed to be in the sixth analytical group. The most significant ones are Mg2+, Li+, Na+ and K+. All the ions are differentiated by flame color: lithium provides a red flame, sodium provides bright yellow (even in the trace amounts), potassium provides violet, and magnesium bright white.